Mid-cap Stocks – The stock market is back on track after Budget 2016. We have seen big bang rally in the stock market in last three trading sessions. Sensex has given 1000 point salute to budget 2016. It is a bitter truth that union budget has failed to live up to expectations of common man. However, an event of the budget has acted as a big game changer for the stock market. All small cap, mid cap and large cap all stocks had given magnificent returns in this rally. 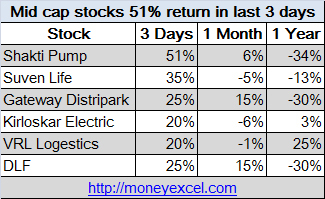 However, few mid-cap stocks have done exceptionally well and given returns up to 51%. Let’s take a look at mid-cap stocks that gave 51% returns in last 3 days. Shakti Pump has given a return of 51% in last three days. A second mid-cap stock that has given magnificent return is Kirloskar Electric. Kirloskar Electric was able to give 20% returns in three days. The main reason behind the increase in stock price is a reduction of excise duty from 12.5% to 6 % on the electric motor, shaft and generator set. It is expected that Shakti Pump and Kirloskar Electric will get major benefit from this decision. Real Estate Investment Trust will become a reality in India as government abolished dividend distribution tax on them. This will bring big benefit to real estate companies like DLF. It is also expected that interest rate will come down in next RBI policy. DLF stock has given a return of 25% in last three days. Suven Life has given a return of 35% in last three days. The main reason behind the increase in stock price is a recent announcement in the budget about a tax rebate for patent filing. 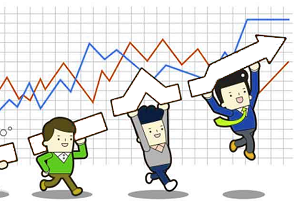 The stock is expected to grow further in coming days. Gateway Distriparks and VRL Logistics has given a return of 25% and 20% in last three days. In budget 2016 proposal is made to revive transport sector by strengthening infrastructure, this move will surely benefit stocks like VRL Logistics and Gateway Distriparks. The current mid-cap rally is based on recent budget announcements. The stocks mentioned above are short term hero and advisable for short-term trading only. This rally is likely to continue if a rate cut is announced in next RBI policy. Investors are advised to trade cautiously. They should invest only in stocks with good future potential. What are your views on the current stock market rally? Which stocks you are buying and why? « How Union Budget 2016 will impact common man budget & spending?